This is a savory and spicy dish featuring the winter root vegetable parsnips. If you have a winter garden, you can pick parsnips after frost has matured their flavor. If you don’t have parsnips growing outside, you can find them in season in stores or farmers markets in the winter months. Let the heat of this dish warm up your winter. 1. Boil the parsnips, potato, 2 bay leaves, salt, and enough water to cover in large pot for 20 minutes on medium-high heat. The parsnips and potato should absorb enough water to be easily mashable. 2. At the same time, roast carrots and sausage in oven at 425º for 15 to 20 minutes in a few tablespoons of water. 4. Spoon mustard onto plate and spread in a circle around the edges. Scoop a mound of mashed parsnip into the center of the circle, then push outward with the spoon to form a nest. 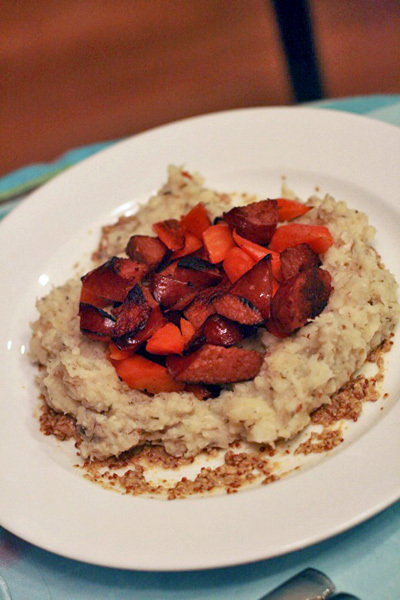 Scoop carrots and sausage into the center and serve warm. Looks delicious. I like that it’s all root vegetables.